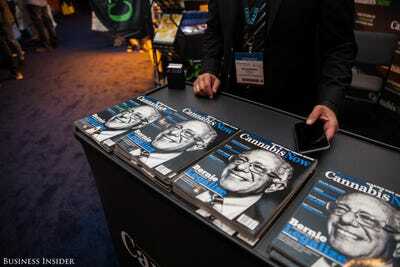 Currently, medical marijuana is legal in 25 states, with several more considering bills. The Tax Foundation, a nonpartisan research group, estimates that it’s a $45 billion industry in the US alone. 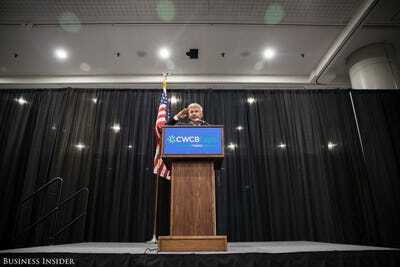 Take a look at what went down inside the two-day conference, Thursday and Friday. 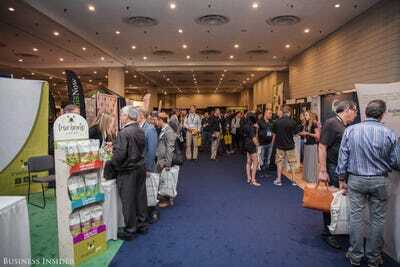 The event took place at the Jacob K. Javits convention center in midtown Manhattan. 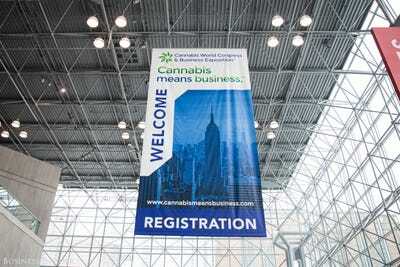 Huge signs with the words 'Cannabis means businesses' showed the attendees they were in the right place. 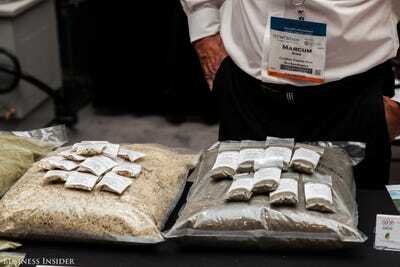 A range of products made from cannabis plants were scattered across the exposition floor. 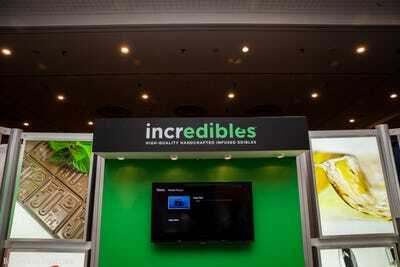 Businesses that directly served the marijuana industry -- everything from grow lights to product packaging and financial services -- also set up shop. These aromatherapy sprays are made from cannabis plants. 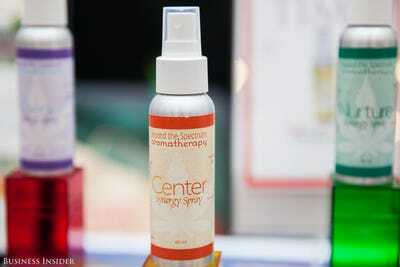 Shira Adler, the creator of Synergy Sprays, mixes all of them by hand. 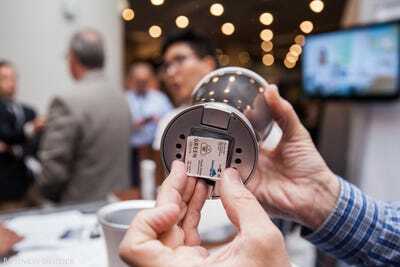 'This one is designed to center you, especially if you're stressed,' Adler said. The sprays cost around $40. The exposition showcased more than just consumer products though. 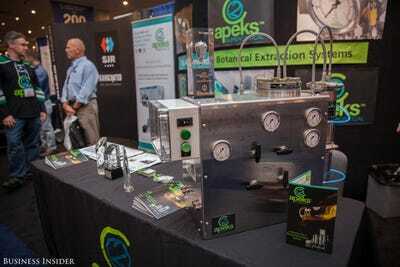 Here's an ethanol extraction machine, which manufacturers use to separate the desired chemical -- in this case, CBD -- from the raw plant for use in consumer products like gummy bears. 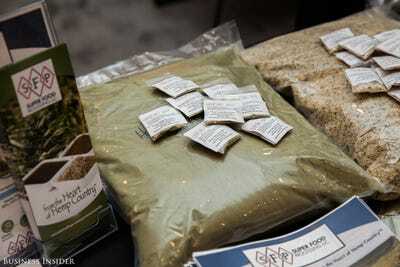 These are hemp seeds, which some proponents claim is a 'superfood' with a range of supposed health benefits. These particular seeds were grown in Kentucky, where the climate and soil is perfect for growing cannabis plants outdoors. 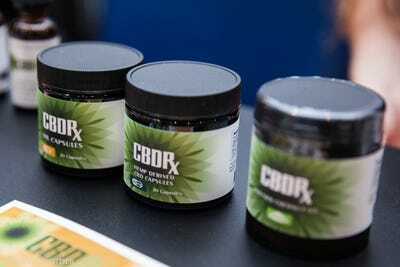 This is CBD oil or 'wax.' 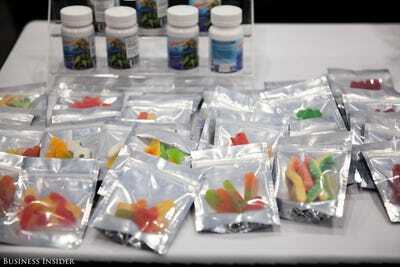 It can be vaporized, inhaled, or mixed into tinctures. 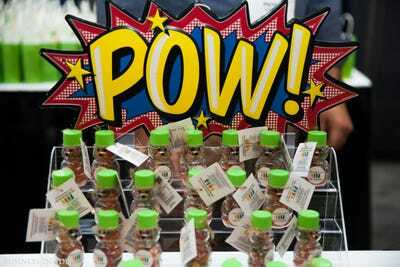 It's supposed to have a range of uses, from beauty to medicine. 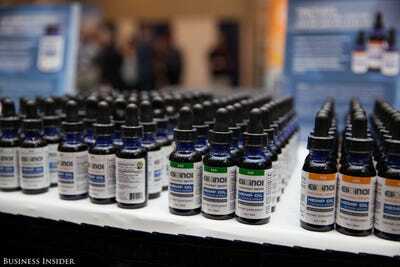 This is Elixinol, a CBD extract taken orally or mixed in with your food. 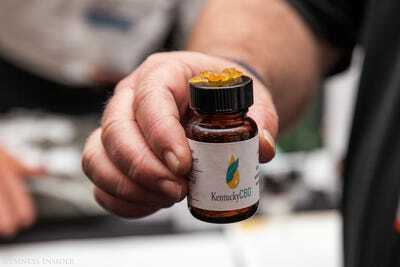 The company is based out of Australia and sells these bottles, which contain 900 milligrams of CBD, for $99. The company sells these chocolate bars, which cost between $20 and $30 depending on potency, in multiple flavours. 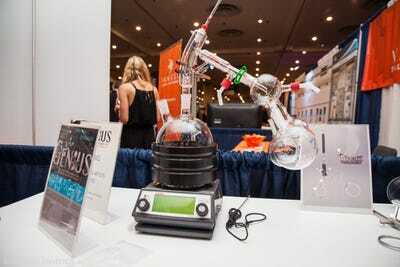 Cannakorp's CannaCloud is a vaporizer aimed at the recreational market. 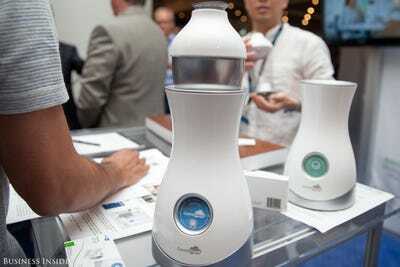 It's billed as the 'Keurig of vaporizers' for its ease of use. The company's chairman is actually a former SVP at Keurig. 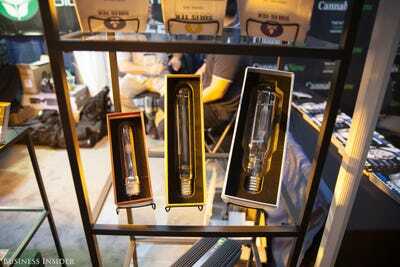 Small packets of cannabis -- in this case, only containing CBD -- are inserted into the bottom of the vaporizer. It's just like brewing a cup of coffee with a K-cup. 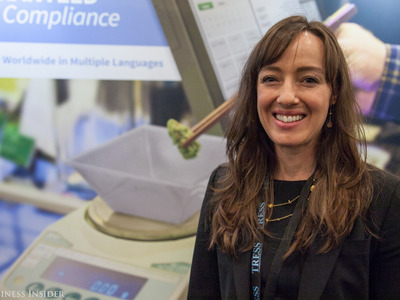 A CannaCloud will set customers back around $150. 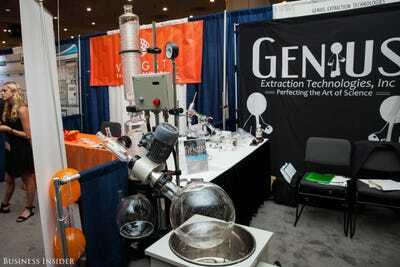 Some more eccentric products also made an appearance on the expo floor. 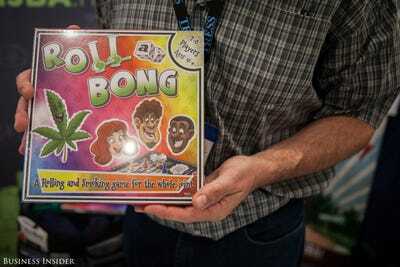 This is Roll-A-Bong, a 'rolling and smoking game for the whole joint.' It's like 'Candyland for adults,' the game's creator and a former high school science teacher Gary Schwartz told us. 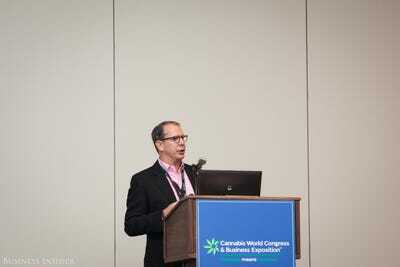 'I created the game for people who worked in the back rooms of marijuana dispensaries, when they were sitting around with nothing to do,' Schwartz said. These are some grow lights in action. They're supposed to be extremely efficient -- and bright. 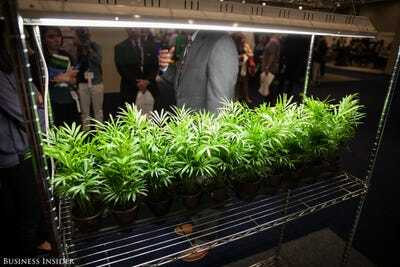 Note that these aren't actual marijuana plants. 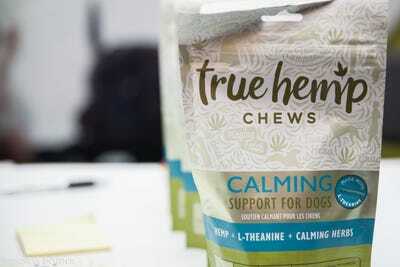 These particular treats are meant to calm your dog. 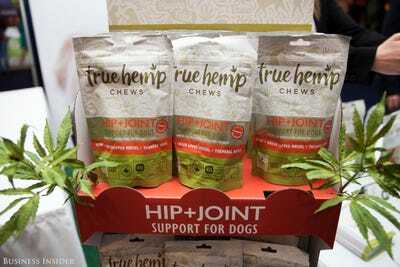 'Don't worry, they won't actually get your puppy high,' Alison Ruks, the marketing director for True Hemp, assured us. A bag of treats costs $11.99.